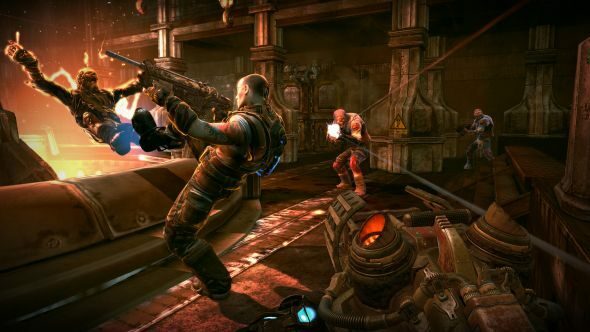 Gearbox officially announced Bulletstorm: Full Clip Edition – a remaster of the hyperactive FPS by People Can Fly – tonight at The Game Awards. Hit up PCGN’s homepage for more news from The Game Awards. So that leak back at the end of September was legitimate, then – Bulletstorm is getting a re-release with improved textures, higher frame rates, higher resolutions and all that jazz. It’s due for release on April 7, and will presumably come bundled with all the extras released for the original, along with the remaster treatment. Additionally, you can swap the main character out for Duke Nukem, and it isn’t just a skin – Duke is fully voiced by John St. John, and they’ve recorded entirely new dialogue, with the character reacting to situations in signature Duke Nukem style. Gearbox also took the moment to announceGearbox Publishing, a new label for indie developers. It’ll be interesting to see what kind of games come out of that, whether they’ll be linked to Gearbox’s existing franchises or if they’re new games completely.